Singing together is a form of amusement and delight...singing in a foreign language provides an enjoyable opportunity to practice the linguistic structures vital to communication in a foreign language. The translations aim at the literal while retaining original rhyme scheme and rhythm where possible. Also includes three appendices of traditional Latin favorites, Christmas songs, and well-known Gregorian chants. ...an amazing variety of songs, old and new, from many cultures...a good resource for the classroom and Latin Club. 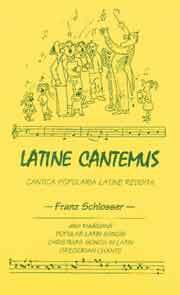 Let’s sing the praises of Franz Schlosser whose renderings of familiar tunes in Latin add zest to any Latin class! This attractive collection of songs and hymns will delight novice Latinists and experts alike both within and outside the classroom. It makes a great gift for persons of all ages with any Latin in their background. Latin teaching tip called "A Song a Day Keeps the Boredom Away!"